We received a sample for a honest an unbiased review. We had the opportunity to facilitate a review for the Sound In tone I65 Headphones. The Sound In tone I65 Headphones are an impressive pair. 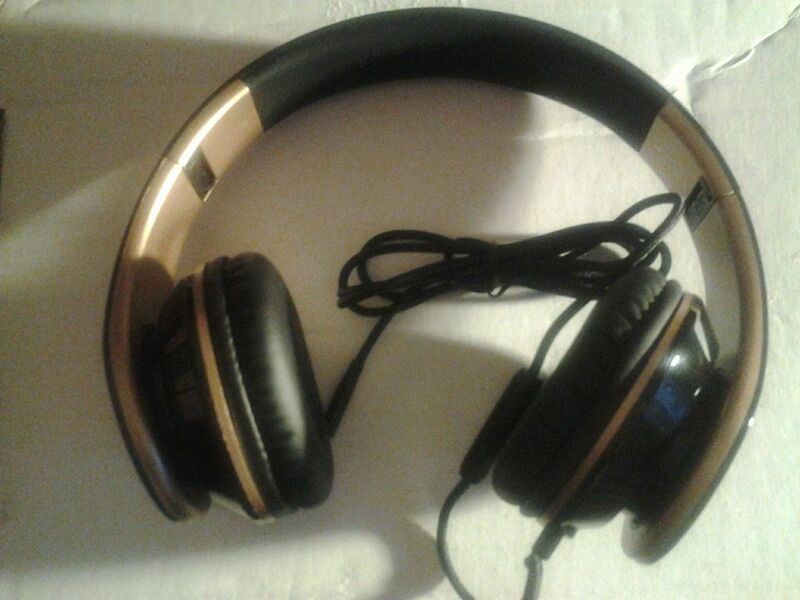 Their stylish and attractive, we received a sharp pair of gold and black headphones. My teenage son had to put them immediately to the test. We all know what's important to teens music and sound. He used the headphones with his smart phone. The sound was great, both him and I thought so. Not that I like "his" music that loud but I have to admit the headphones produce a fantastic sound. The headphones are an over the ear design, offering a sleek style with a slim profile and adjustable contoured headband. The cushioned pressure relieving ear pads will rest comfortably on your ears, even after long periods of use. Their easy to position to what feels comfortable for you. The headphones fold up in a compact design. The foldable ear cups help the headphones lay flat for compact storage. This makes them easy to take anywhere. My son has the perfect outer pocket on his book bag that they fit nicely inside of. Their lightweight at only 10 1/2 ounces. These headphones have a hands-free built in microphone with remote control and universal switch for all 3.5mm jack devices. Their compatible with Smart Phones, computers, MP3 players and tablets. The cable is braided making them more durable. You can easily switch between a call on your phone to music, there is no need to reach for the device. We are completely satisfied and pleased with the Sound In tone I65 Headphones. They are a stylish, durable pair that fit comfortably. The sound is great with both music and calls. I asked my son if they made his top ten favorite headphones, he said absolutely. They are also affordable making these a great idea for the coming holidays! You can connect via Amazon . These really are impressive headphones and I like how sleek they look and that they are great for everyday use. I have had headphones that are not comfortable and I am glad that these feel great! You know, we used to have a set of headphones, and I am not really sure what happened to them. I work in a fairly "loud" environment, and when I really need to focus on data entry, it would be great to slip on some headphones. These sound like they would be perfect. Love the built in microphone and the ease of being able to switch between music and calls!!! Plus a braided cord means you wont have to worry about fraying anytime soon! !